Quite honestly, I was shocked. Spam was something I prepared while a single mom struggling to stretch a dollar. I would glorify it with barbecue sauce. As my Southern Grammy would say, “Barbecue sauce can make anything taste good.” I’m fairly certain she had to stretch a few dollars in her lifetime as well. 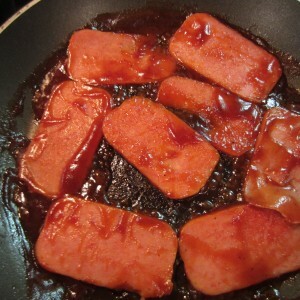 Place sliced Spam in a skillet and smother in barbecue sauce. Heck, the cheapest brand you can find works just fine. 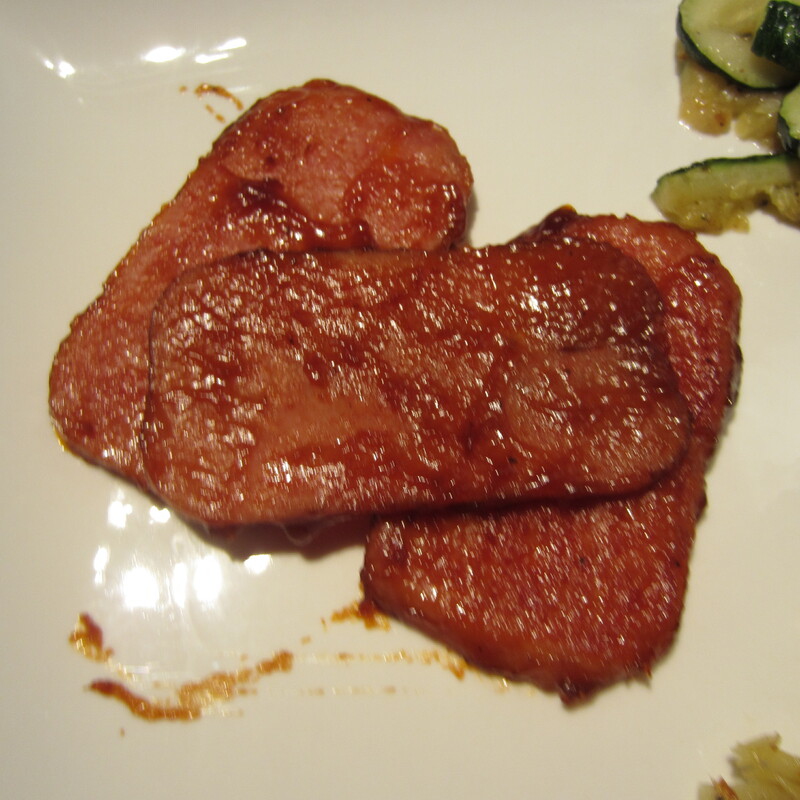 Cook over medium heat turning the Spam slices to ensure they are evenly coated in the sauce. Cook slices until slightly crispy and most of the sauce has been reduced. They aren’t pretty to look at, but I promise they are quite tasty. If you can’t bear their appearance, put them between slices of bread. My side dish preference with Spam is fried potatoes with onions and sauteed zucchini slices.The whole meal reminds of something a cowboy or farm worker would welcome after a tiring work day. It’s called comfort food! I can’t help but crack a smile when I consider the magnificent restaurants the Wine Guy and I frequent, not to mention the wine gigs we attend. 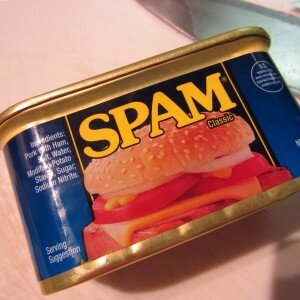 What a twist to feature Spam as a meal of choice. I wonder what kind of wine my honey-man would recommend with this gourmet meal. Probably Boone’s Farm! As for me, a tall glass of my grandpa’s buttermilk would work just fine. 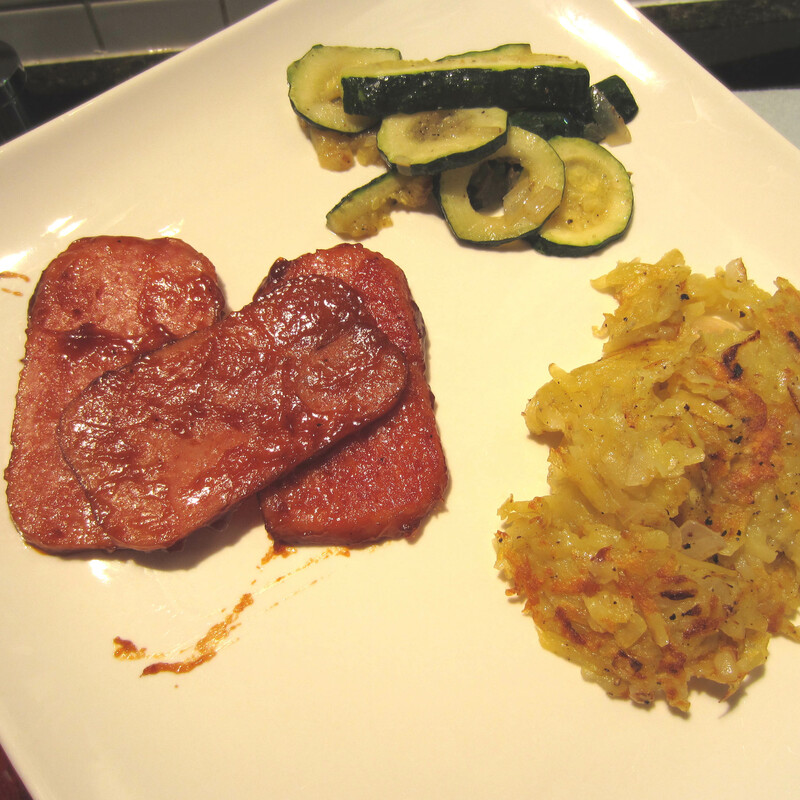 Calories for 3 slices of this BBQ meat is in the neighborhood of 220 calories. Surprised? So was I. Even with a scoop of the fried pototoes and zuchinni you’re only around 350 calories. 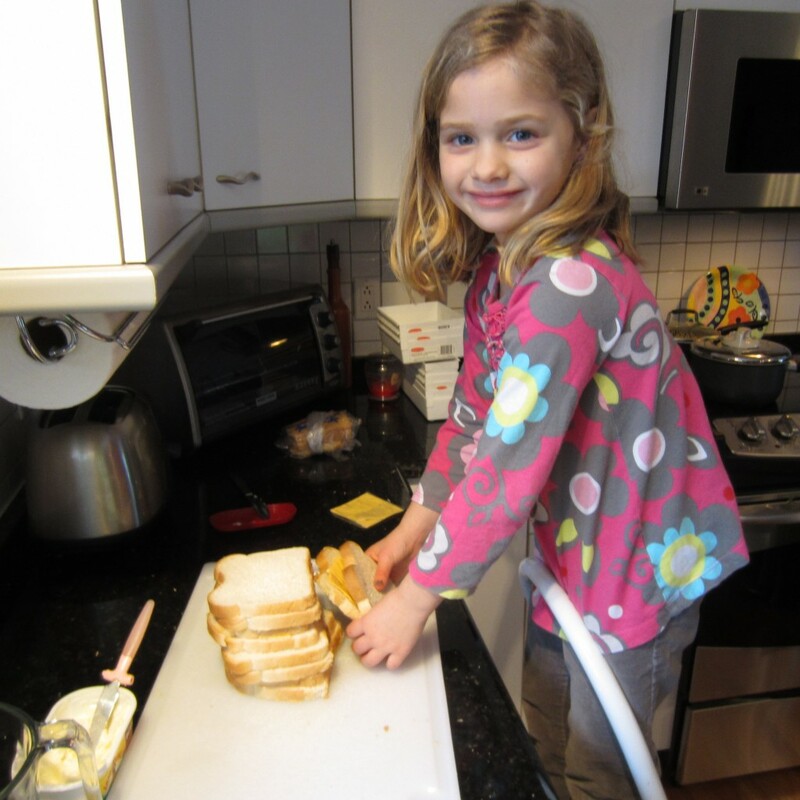 My granddaughter, Olivia, helped Blimpy Girl NeeNee prepare grilled cheese sandwiches for lunch. 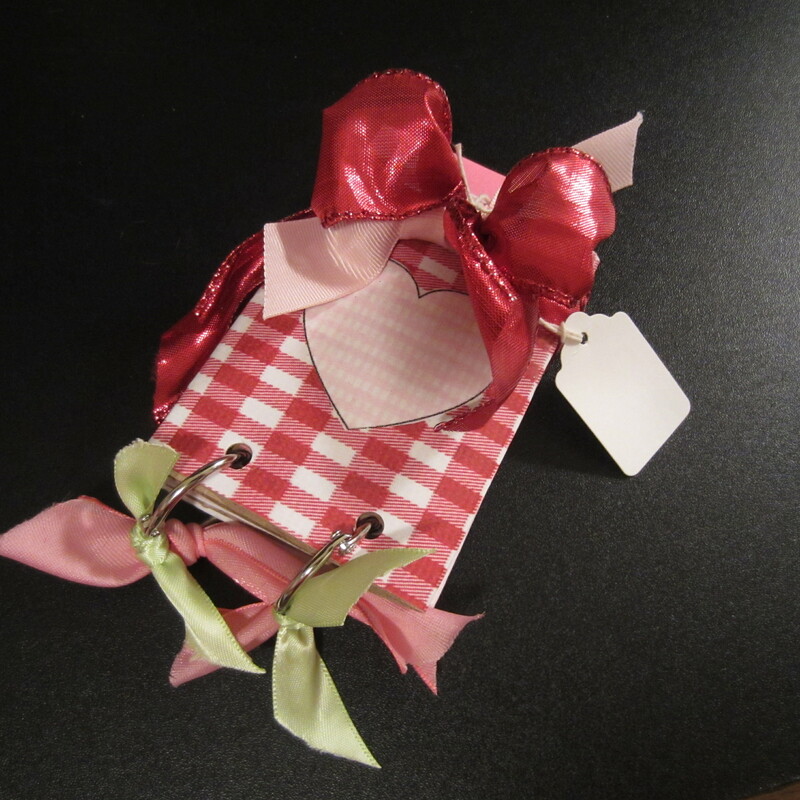 Because she loves all things pink, she requested her pink knife to butter the bread slices. You will note the knife in the butter container (far left). My grown daughter swears I make the best grilled cheese sandwich EVER. To her, it ranks right up there with “no one cuts a PBJ sandwich like you do mom”. As a little girl she said the way I cut the sandwich made it taste extra good. I think it was because I made a nice clean cut with a chef’s knife instead of a butter knife. It’s funny the things your kids remember about their childhood. My grilled cheese secret is so simple. First, use whipped butter spread instead of stick butter. Low-fat whipped butter is even better and about half the calories. Now, the secret is revealed…. BUTTER BOTH SIDES OF THE BREAD SLICES and add butter to the skillet when cooking. Oh no, the secret is out. 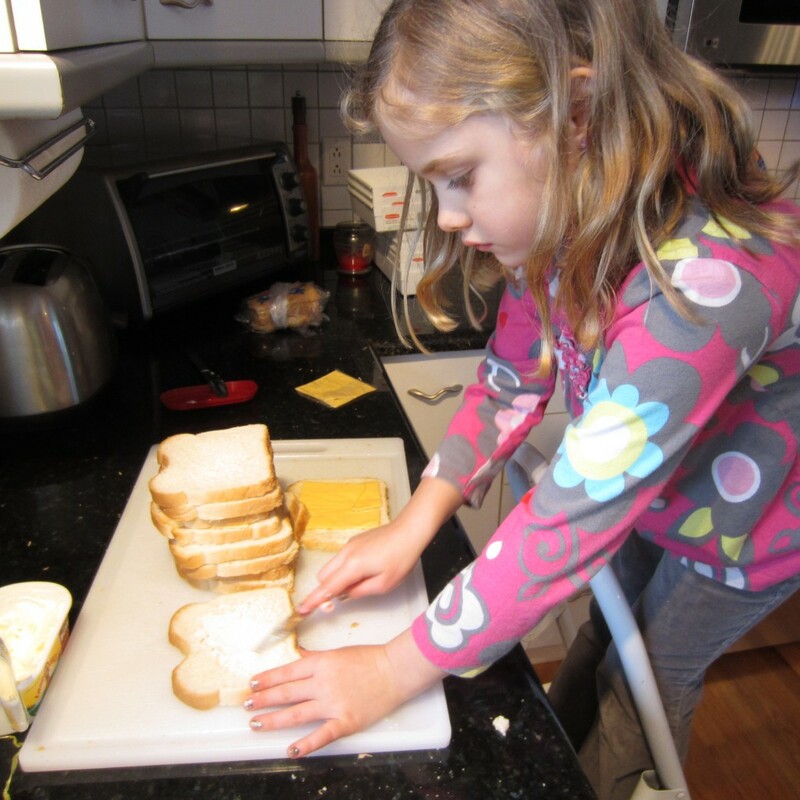 My daughter always thought I did something magical to make the grilled cheese so yummy. All this time it was the butter fairy. For the record, grilled cheese is not part of my Blimpy Girl eating plan. My granddaughter’s feeling would be hurt if I didn’t partake of her buttered slices. My guess on calories… in the neighborhood of 400 per sandwich (we didn’t use low-fat butter spread). Fat from the butter…. well, let’s not go there! Side note: Use low-fat cheddar cheese slices. A mere 25 calories and zero fat calories. That will help offset the butter and bread calories. Now this is a dish that screams YUMMY!!!! 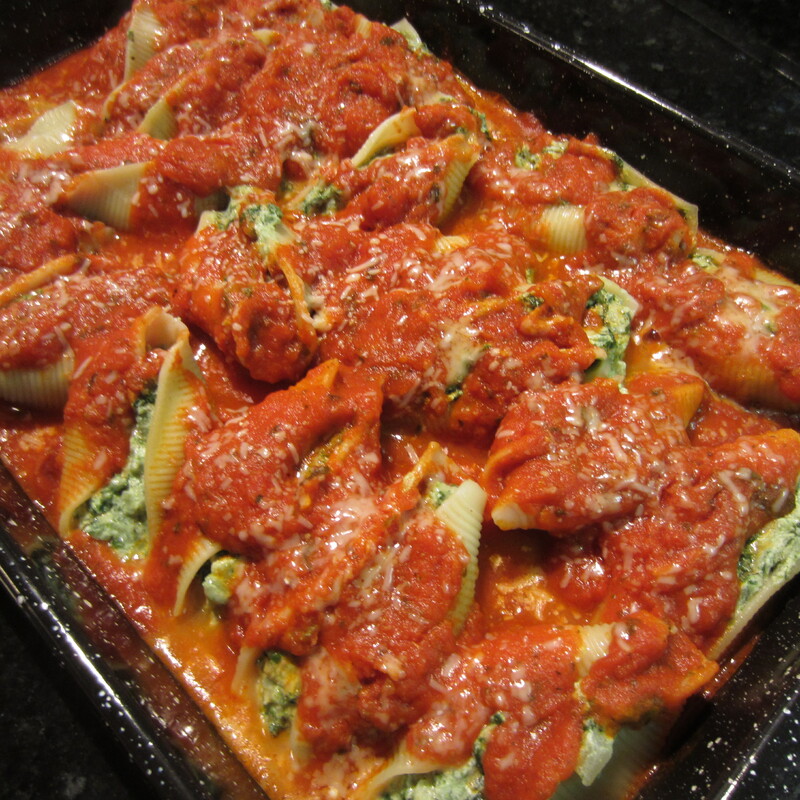 This entire pan of stuffed shells was gone within minutes. Serve it up as a Meatless Monday dish along with a side salad. This is comfort food to the max. The kale is an added nutritional benefit and offsets the cheese calories. This dish made approximately 18 stuffed jumbo shells. Serving size is 3-4 shells. Three shells with a salad was plenty for me.and in the neighborhood of 460 calories. If you substitute marina sauce for the tomato basil pasta sauce, you can deduct 57 calories. The filling is so tasty, I doubt you will even notice the difference. 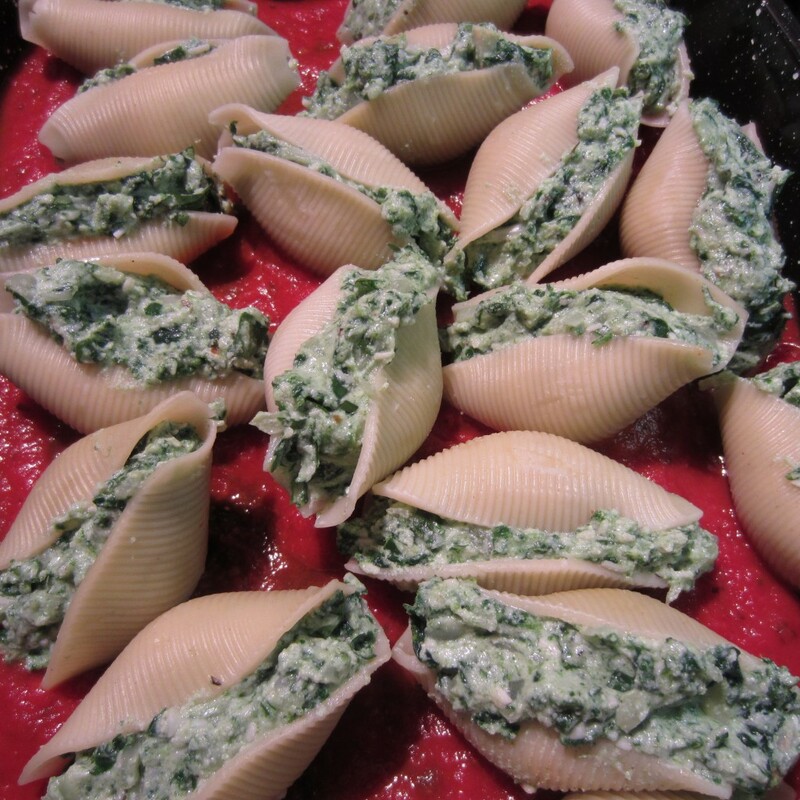 Kale, spinach and flat leaf parsley are the “green” binders for the shell filling. Low-fat ricotta chees and an egg seal the deal. It take some time to fill the shells, but watching an episode of NCIS (with my man, Mark Harmon) certainly made the time fly. Every Wednesday the grand kids come for an overnight. 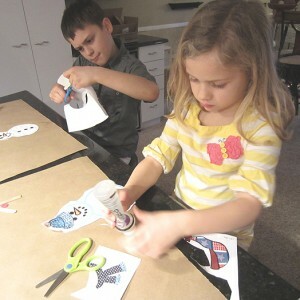 I plan a creative activity for the kids to do while I prepare dinner. 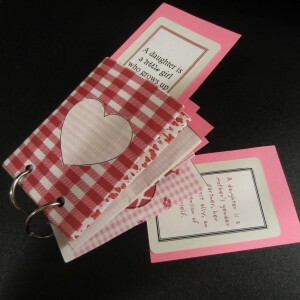 This week it was a pre-Valentine scavenger hunt. 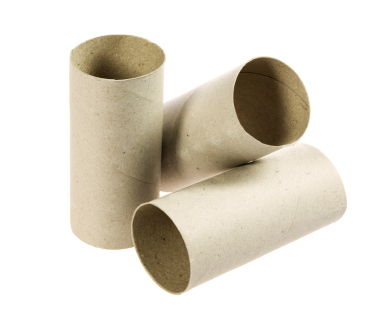 I tore sheets of white paper from a packing roll at work. They were the place mats. 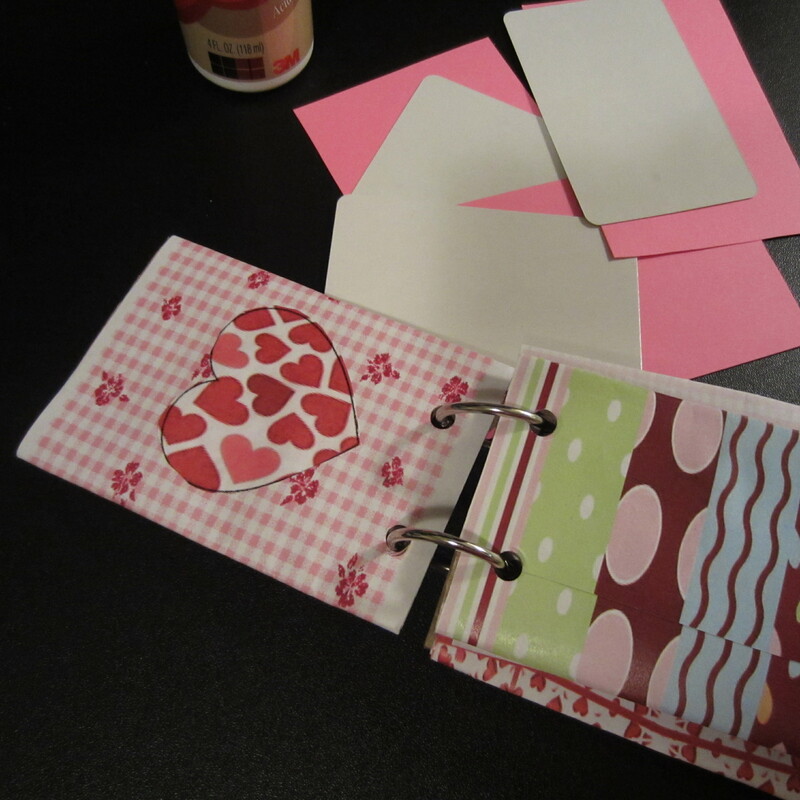 Next, large hearts were printed on card stock paper and taped to each mat. Now for the scavenger hunt…. hmmmm… we are working with a 3, 6, and 8 year old which means the hunt must be relatively easy to finish by dinner time. 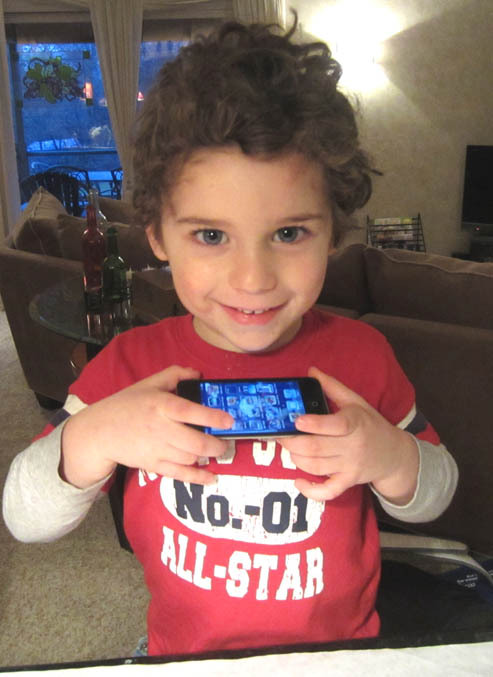 Three year old, Fischer had to find 3 colored objects. A green, a red, and something yellow. He also needed a noise making object and something round. 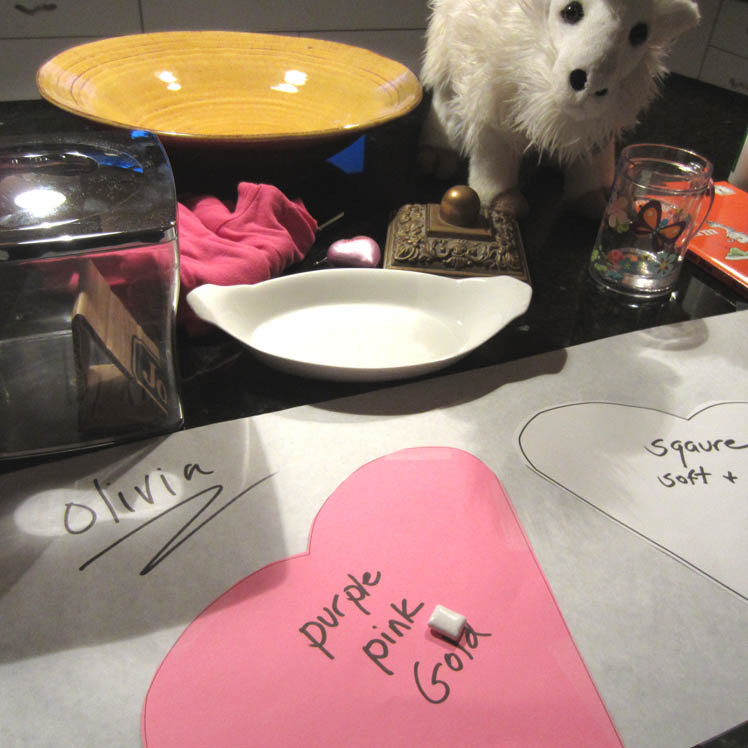 Each grand kid had different items to find and place next to their place mats. The rule was you must be able carry the item in your hands. Geezzz, didn’t want a sofa sitting on the counter top. It proved a successful pre-dinner game. 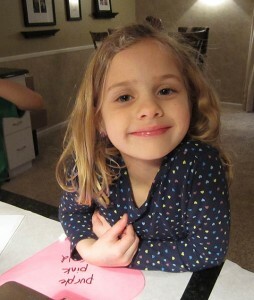 The kids had a blast running around the house seeking the items on their list. 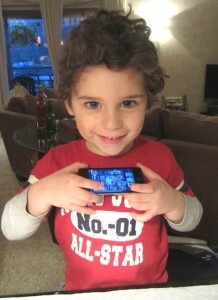 Fischer was quite proud that his brother’s Ipod was the noise object. The best part, you can use this idea for any occasion. 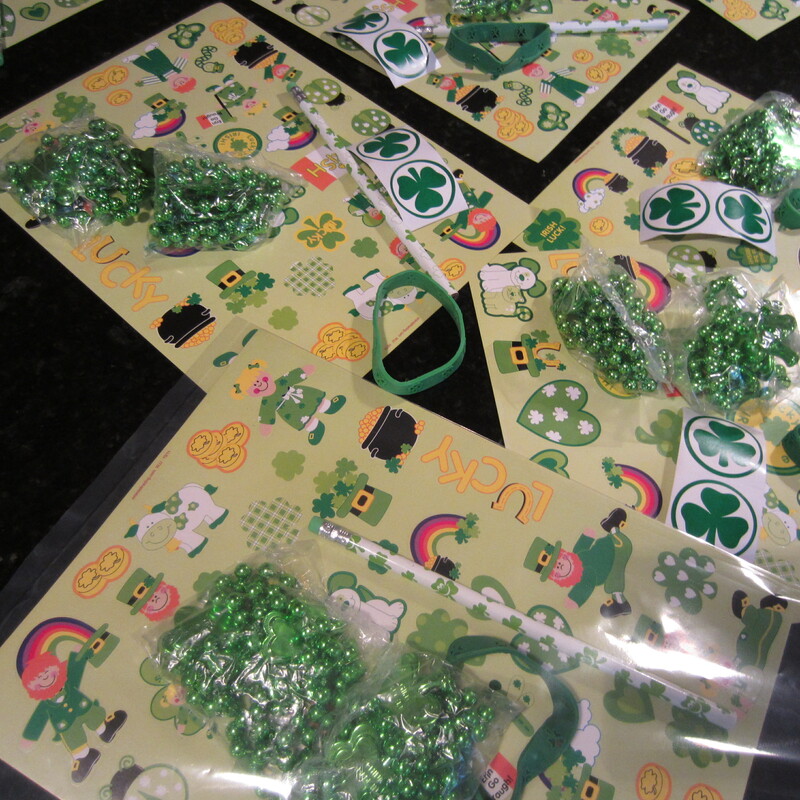 St. Patrick’s Day, Fourth of July, Birthdays… kids 10 and under will love it! Certainly you could make it over the top… but, why? It’s a throw away place mat. Don’t labor over it. I promise, kids aren’t concerned with your elaborate ideas, they only want to have fun and share time with you. I’m not usually an advocate of packaged soups because of the high sodium and cholesterol levels. This soup packs 960 mg of sodium (about 40%). On the plus side, it has zero cholesterol, trans-fat and sugars. 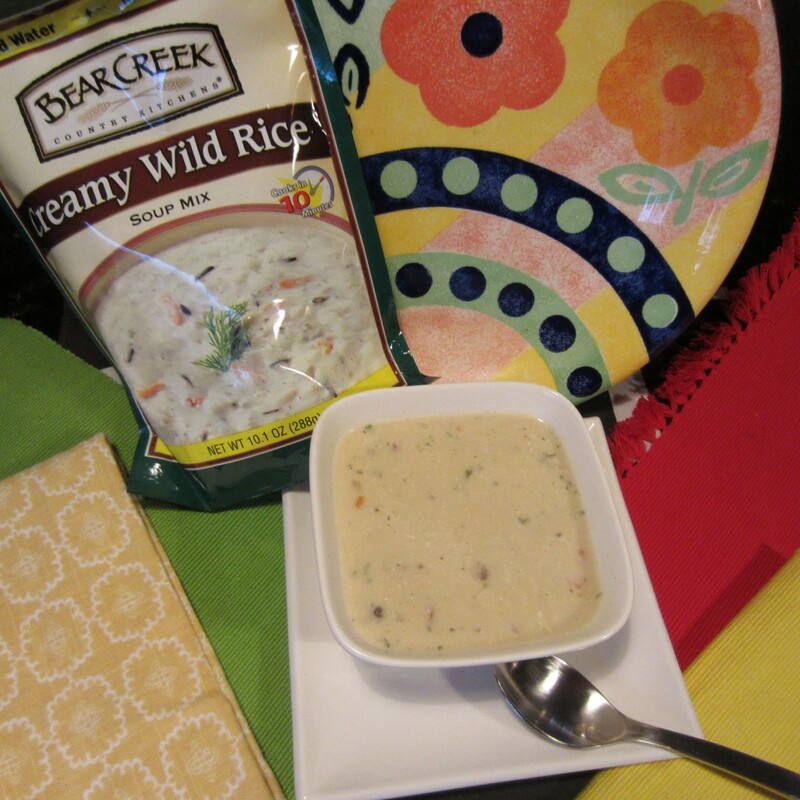 The soup is easily enhanced by adding 1/2 pound chopped chicken (cooked) and one cup diced portabella mushrooms. 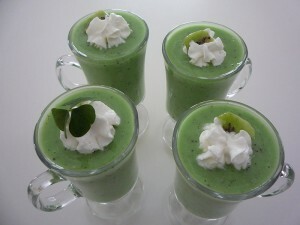 Before these additions, the calorie intake is minimal: 130 calories per prepared cup. Water is the only ingredient added to the powdered mix. 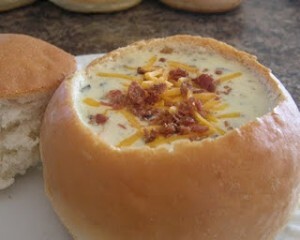 Consider using a bread bowl to serve the soup. You can make your own bread, or pick up fresh bread from a local bakery. I would love to make my own bread, but 15 hour work days make it impossible. Until I retire (at age 101), I’ll be using local bakery shops. In my mind, fresh bread and soup are joined at the hip. Every Wednesday night the grand kids come for an overnighter to attend Awana classes and hang out for popcorn and movie. “The Blimpy Girl, better known to them as “NeeNee”, always make sure there is a pre-dinner craft to occupy time and help them focus on their creative abilities. 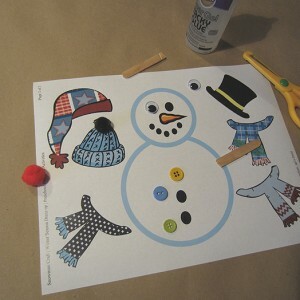 Last night it was snowing … hmmm… how about making snowman placemats that can later be cut-out and applied to lunch bags. 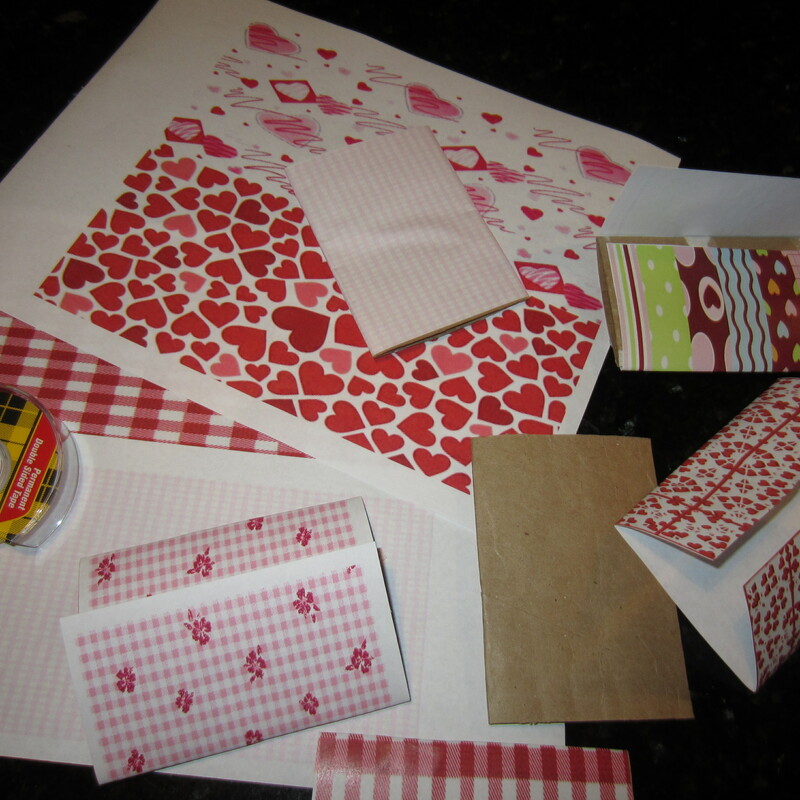 I had plenty of left-over craft supplies from summer vacation with the grand kids. 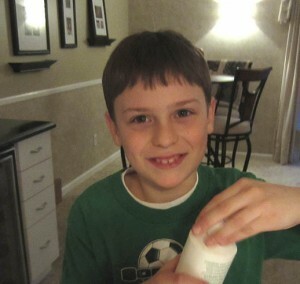 Eight year old, Carson, was excited to make the snowman, but opted out on the lunch bag idea. 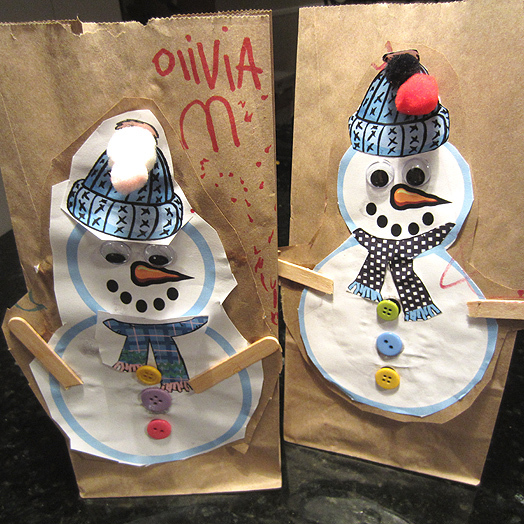 He’s a bit beyond a snowman lunch bag (and I don’t blame him). The 3 and 5 year old were all about it. I printed out the snowman from here, and then assembled various craft items to make the snowman more interesting. 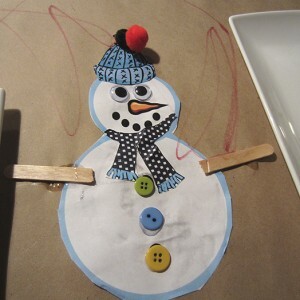 Wiggle eyes, pom-poms for the top of the hat, ice cream sticks cut in half for the arms and colorful buttons. This was 3 year old, Fischer’s, snowman. He goes to pre-school and was sooo excited about his lunch bag. 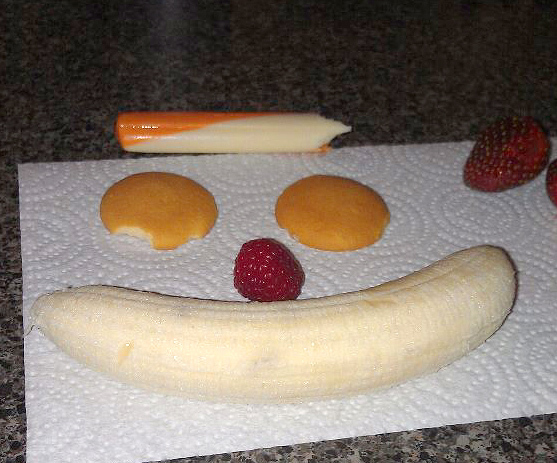 We filled it with string cheese, fresh strawberries, slice of bologna with no bread (don’t ask) and a banana. The younger kids got a kick out of picking out their snowman lunch. Oh, to be young again. Little people are happy with the smallest things. 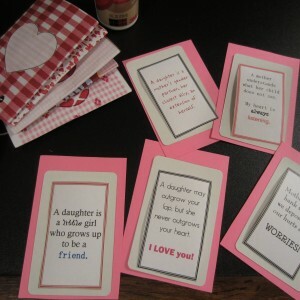 As long as you’re spending time with them and they feel special, they are happy campers. This is the part of the lunch my 3-year old grandson packed. 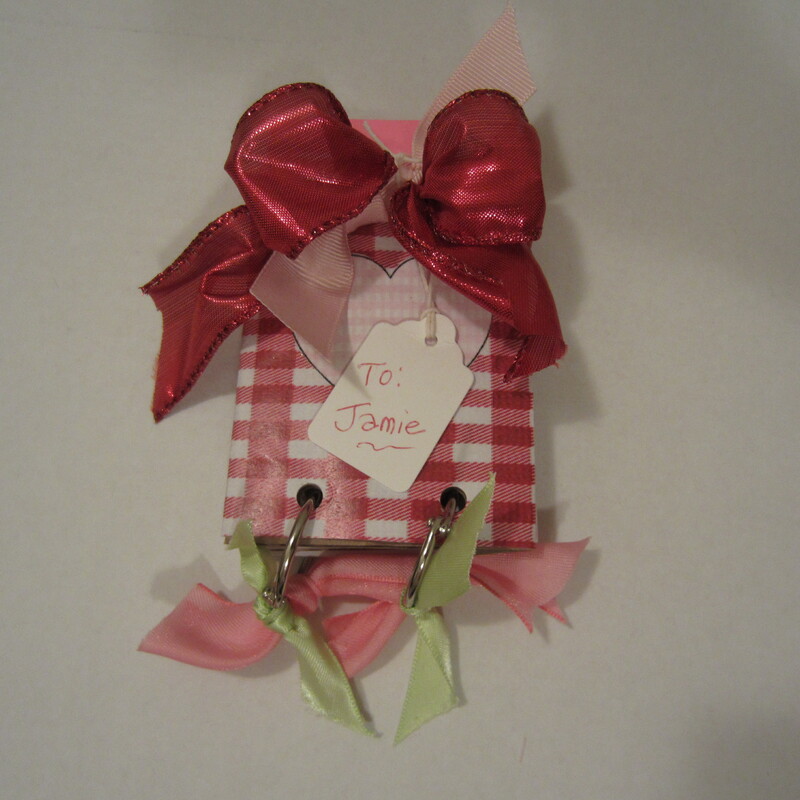 His nanny, Jenni, was so creative in making it fun. I think a bite (or two) was taken out of one eye and eyebrows…think?? I know, I know. 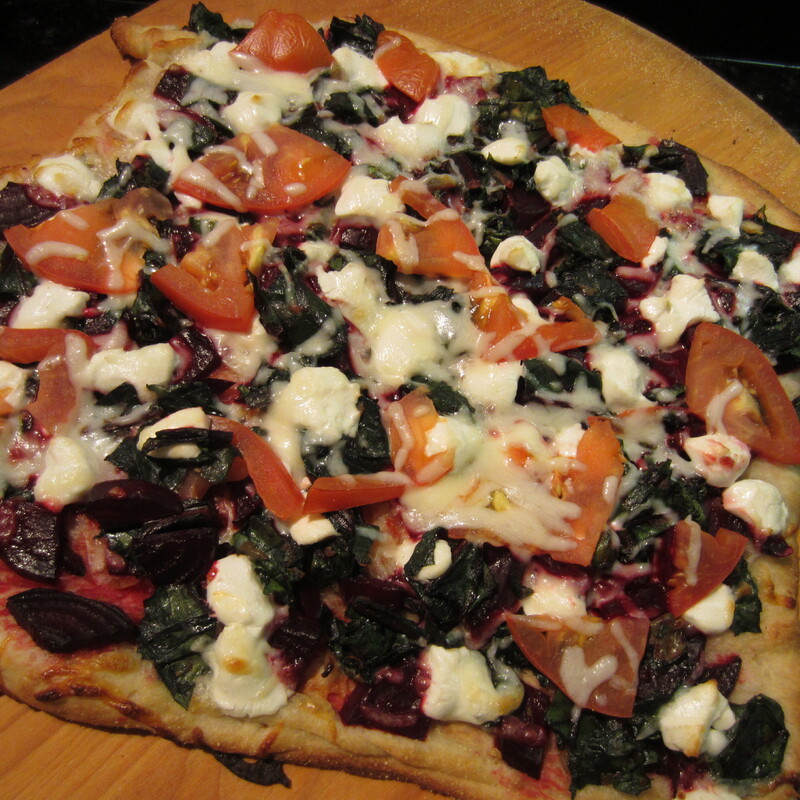 Fresh beets on a pizza? That’s affirmative and it’s so amazingly delicious. If you’re not a beet lover, this pizza dish might win you over. The most time consuming part of this recipe is preparing the beets. They need to bake for 40 minutes. I suppose I could use canned beets, but why when I can use fresh ones? 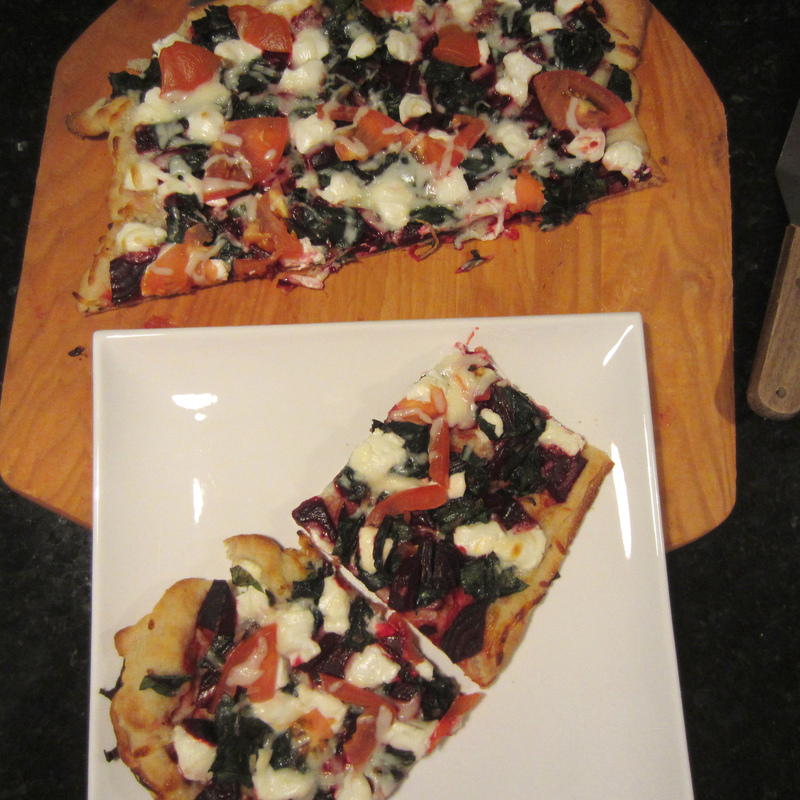 Besides, I chopped the beet leaves and added as a pizza topping (similar to using spinach). Great way to get in that green veggie. 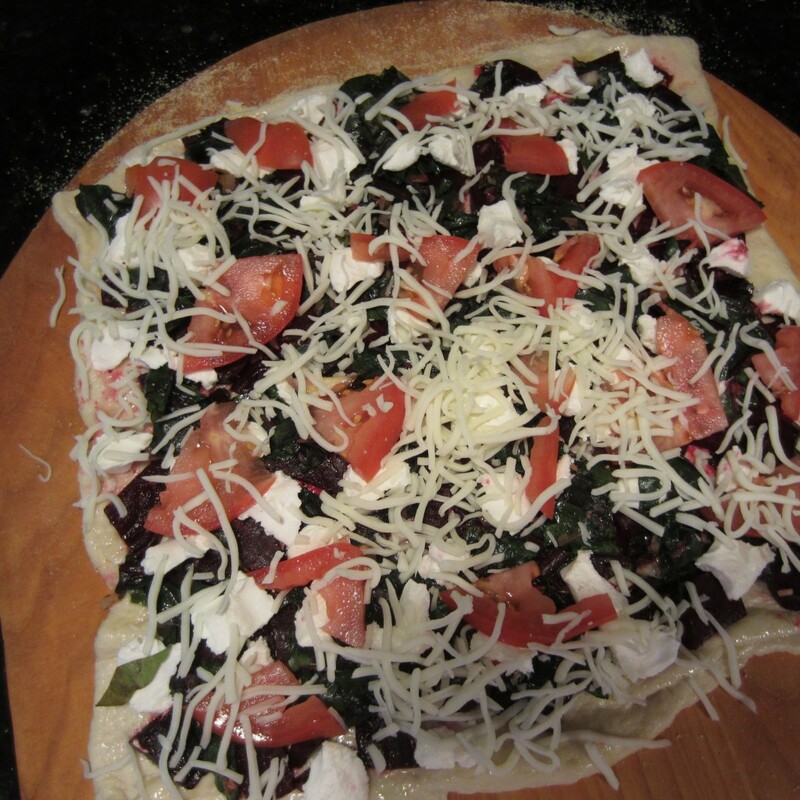 Other toppings include goat cheese, low-fat mozzarella cheese, and tomato slices. Kalamata olives and roasted red peppers are excellent topping choices. 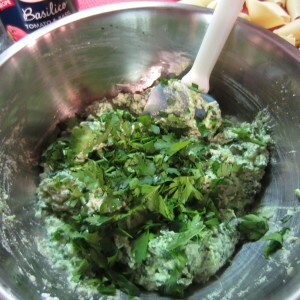 Basil flavored olive oil is the base (no pizza sauce!). I am falling in love with “Frittata” dishes. 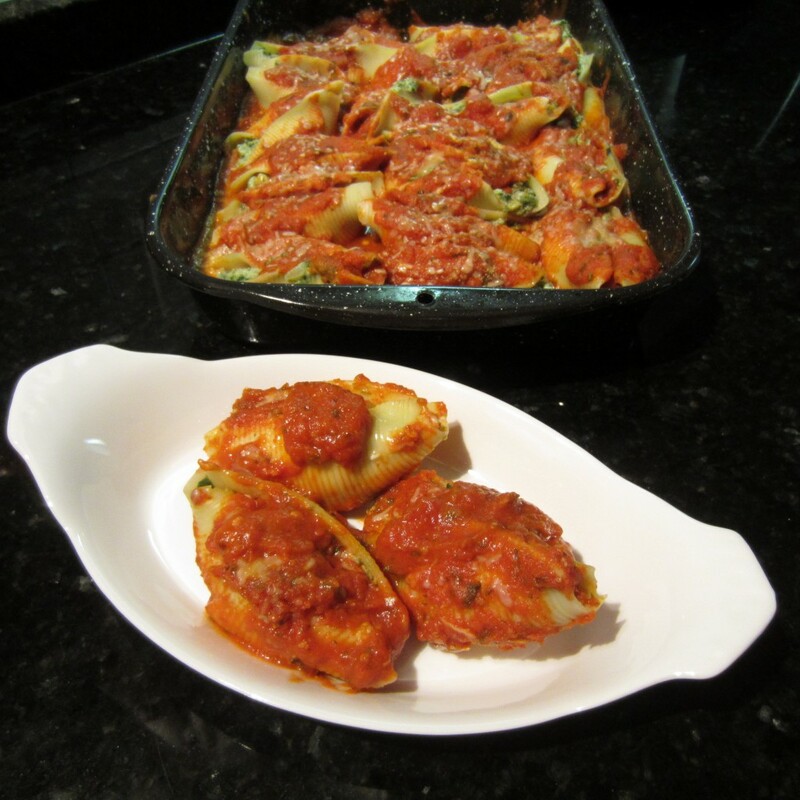 They are quick, great for using up leftovers and generally low in calories. 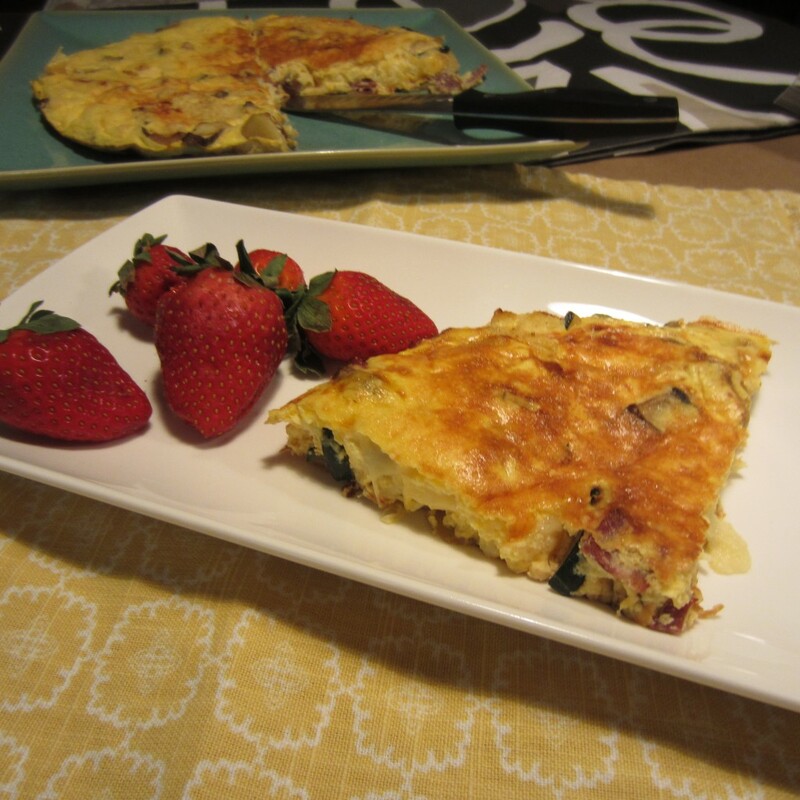 A generous slice of this frittata will only cost you about 200 calories, less if you use low-fat cheeses. I didn’t have any low-fat Swiss cheese on hand, so used regular Swiss. This dish will take you about 20 minutes to prepare. Yes, it’s true… 20 minutes. 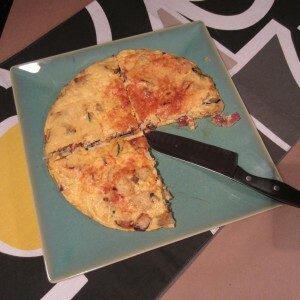 The egg filling includes chunks of portabella mushroom, turkey bacon, apple, and three different cheeses. I added a diced zucchini just because it needed to be used up. Fresh strawberries are a perfect pairing with the 3 cheeses.